I have photographed several surprise wedding engagements. 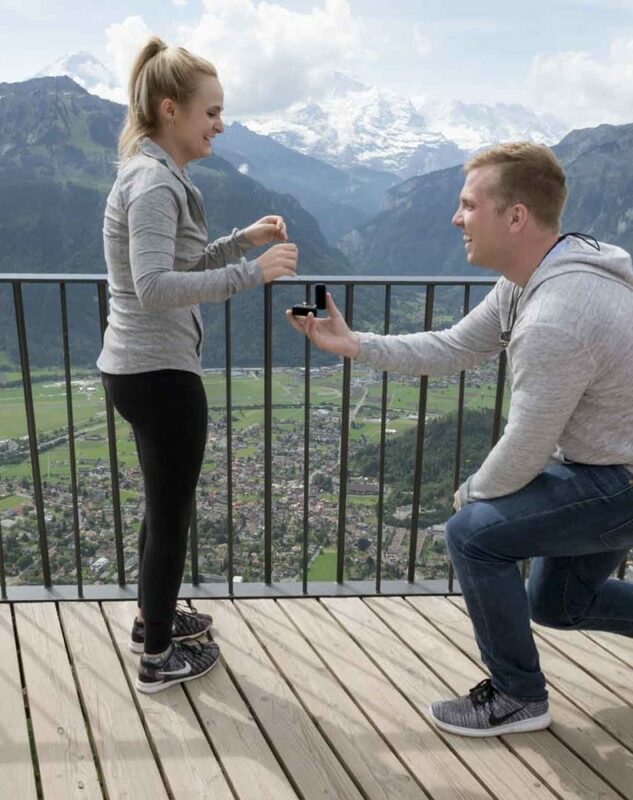 Every surprise marriage proposal was different and a lot of fun. We can meet at a location and I will be unknown to your girlfriend. After proposing, you can introduce me to your fiance. I can take more pictures. Your fiance will want to break the news to her family and friends. I can take a few pictures with your cellphone. My pictures will be ready to download from your web gallery in 6 – 24 hours. ♥ I am unknown to your girlfriend. I’m just another tourist taking pictures. I keep my distance until it is time for you to propose. Unfortunately, I have no control over the situation. You could be standing in the wrong place. The sun might be casting shadows on to her face. People could be walking past. One idea to give me some control is to suggest to your girlfriend that you ask “that man over there” (me) to take a picture of you both with your camera. I can position you both better with the sun and mountains in the background. ♥ Ask your girlfriend to marry you during a couple’s photo shoot / sightseeing tour. We can visit one or more locations. You can give me a signal when you are ready to propose marriage. We can travel around in my car or your hire car. Invite your girlfriend to wear nice clothes and makeup. Perhaps she is comfortable sharing photos with family and friends without makeup and wearing blue jeans, etc. Ask her to put on some makeup as you want to invite out to a restaurant after a walk. Below is an idea of the prices. Payment on the day please in Swiss Francs. Other payment options available. There are no hidden extras in the prices quoted below. The prices are for a photo shoot Sunday to Thursday. I like to keep Friday and Saturday free for weddings, etc. Please remember that I have a lot of editing to do after the photo shoot. Duration: about 45 minutes to 1 hour. We meet somewhere in or near Interlaken. I will send you directions of how to get to the location by bus, train or car. I am unknown to your girlfriend. You propose marriage and I jump in and take the pictures. We can have a short photo shoot afterwards in the same location. Location in Interlaken or nearby. You can travel with the bus (15 – 20 minutes) to the location where we can meet. I will send you a map and travel itinerary for the bus, etc. Duration 2-3 hours with the travel in my car. You can propose marriage to your girlfriend during a photo shoot – sightseeing tour. We will visit TWO different locations close to Interlaken using my car (castle, mountain or by the lake). Duration 4-5 hours. Propose marriage to your girlfriend during a photo shoot / sight-seeing tour. Using my car, we will visit THREE different locations close to Interlaken (castle, mountain and by the lake). Afterwards, you can introduce me to your fiancee. I am the first to congratulate you both! We can take some pictures of you both and the ring. I can take some pictures using your iPhone or mobile device. Your fiancee might want to announce her engagement quickly over Facebook, etc. My work is not finished. I have to work on the pictures in post production. There will be a lot of pictures to process with a three hour photo shoot. I will upload the pictures to your secure on-line web galley. I will send you a link and PIN number. You can download the pictures at no extra cost. The pictures will stay on your web galley for 2-4 weeks. I will keep a backup. I can easily create a new web gallery. The weather can be a problem. It is difficult to forecast because of the mountains. The clouds might be covering the mountains. The sun could be in the wrong place. Normally it is possible to change the day for better weather. I would also recommend staying for two days in Interlaken. We can switch days if the weather is bad. We can also plan the surprise on the day you arrive or depart. Check out the hotel options in Ringgenberg, Goldswil, Bönigen and Wilderswil. These places are a short bus ride or train ride from the center of Interlaken offering traditional Swiss hospitality. This is good and need not be expensive. Many of the hotel’s are family businesses offering an excellent service. Post Production (Editing) (included in the price above). I shoot in raw format on Nikon D850 and D810 cameras. I will deliver your images in JPG format. Size: 3500 pixels on the longest edge. There is some work to do on the images after the photo shoot. I will have to adjust the brightness and contrast on every image. Remove some objects like fences in Photoshop. I will upload all of the best pictures. Over 100+ depending on the photo shoot. Web Gallery (included in the price). The files will be available for download from your web gallery at no extra cost to you or your family. It will be online 2-4 weeks. I can easily upload it again when it disappears from my backup. Payment on the day of the photo shoot. Swiss Francs. No deposit required. There are no hidden costs like sales tax, etc. I will not send you a contract. We can agree everything by e-mail. Cancellation up to 12 hours before the event. There are no cancellation fees. There are no restrictions on how you use the pictures. There will be no watermarks on the images. Remember to give me the credit as photographer if the pictures are used in a magazine. I will be using a few pictures on my website and social media if it is okay with you. Please add an extra CHF. 300.- to my prices if you will NOT PERMIT me to use the pictures (you want total privacy). The engagement session will be fun. We hangout and you will quickly be at ease with me taking pictures. I will show you the pictures on my camera. Ask you for ideas. We can have a coffee or beer together. It will be a great time together.